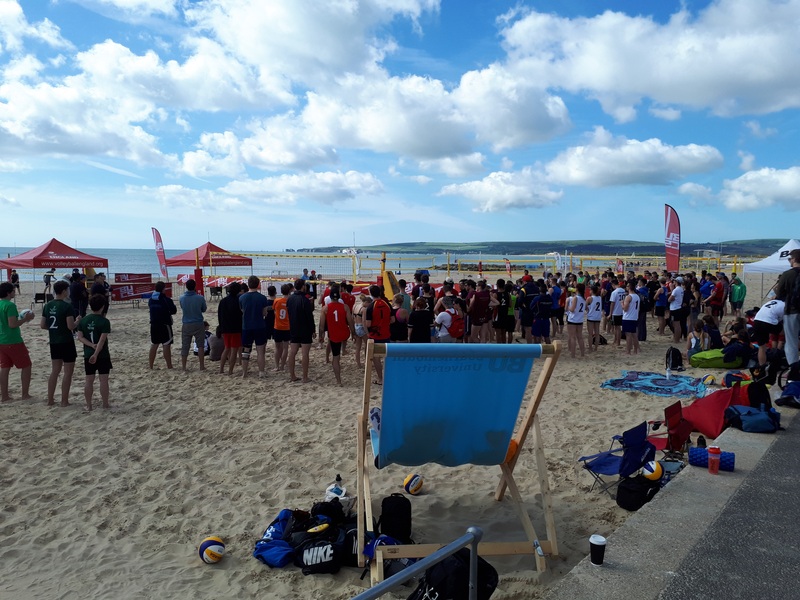 It was beach volleyball instead of sitting volleyball last weekend as I joined Volleyball England and Bournemouth University to deliver the first ever BUCS (British Universities and Colleges Sport) Beach Volleyball Championships on Sandbanks Beach in Dorset. In what were two of the hottest days of the year so far, the set-up was hard work! 24 courts had to be created which involved digging holes for posts, hanging nets, and flattening out the beach. Once the courts were ready over 80 pairs arrived to compete in the south-coast sunshine. The first day involved more than 175 matches taking place and I was responsible for updating the results tables for the 24 pools. The final day saw some more high-quality volleyball and the culmination of championship, shield and trophy competitions with successes for Northumbria, Bournemouth, Cardiff & St Andrews.